January 31st is 'National Gorilla Suit Day,' and in celebration, we present our second annual Gorilla Suit story -- 'Mr. Columbus Coriander's Gorilla' by Noah Brooks (sometimes wrongly credited to Max Adeler) from 1869. This is a great story -- a true American Classic! Our First Gorilla Suit story can be found here. We continue with stories concerning Animals this week! O Henry tells a tale of a con man who takes up with a hog thief in 'The Ethics of Pig' from 1906. Stories about Animals lurk in the Basement this week! Today we feature an 1868 tale about the nastiest canine ever in 'The Dog-Gondest Dog' by Marcus Mills ('Brick') Pomeroy. 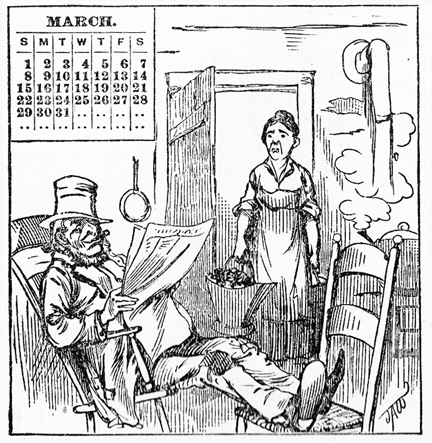 SUNDAY SALAD features an ANNOUNCEMENT about our special episode number ONE THOUSAND coming in about a month, and also two great Stanley Huntley stories -- first we have a tale of a failed politician with a plan in 'Broken Up' from 1882 and the Spoopendykes struggle with a train schedule in 'Studying the Time-Table' from 1883. 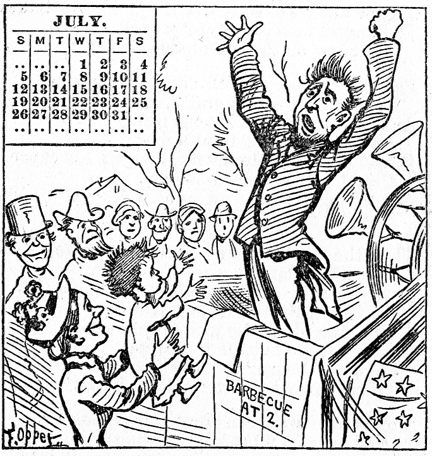 In another extremely rare story from the 1885 edition of 'The St. Jacobs Oil Family Calendar and Book of Health and Humor,' Bill Nye points his devastatingly sharp pen on the traditional Fourth of July Barbeque. Fun stuff! From the month of May we offer a piece about a -- well -- a piece of pie, that maybe ought not be pie in the story 'The Rhubarb Pie.' A recipe is included! Mr. Bowser comes up with a fabulous idea to make millions of dollars in 'The Snow and Ice Tycoon' from 1900 by C. B. Lewis under the pen name of M. Quad. Today we offer THREE very short and funny stories by Thomas L. Masson -- A boy gets stuck with an opera ticket in 'Poor Willie,' a man's life from Kindergarten to senility is covered in a few paragraphs in 'Work and Play' and a rich man wants to leave a literary legacy in 'The Refusal' all from 1905. 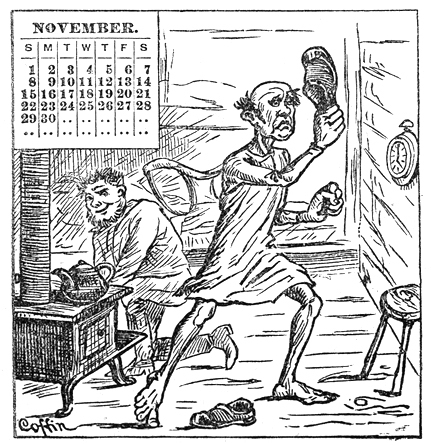 A judge uncovers the cause of a raving lunatic's insanity in 'No Hope for Such as He' by Thomas L. Masson from 1905. SUNDAY SALAD offers TWO Stanley Huntley stories -- from 1883, A Minister attempts to bring a request to the assumptive newspaper's editor in 'A Trifling Misunderstanding' and Mr. and Mrs. Spoopendyke search for a missing raincoat in 'Wanted His Waterproof' from 1882. All things considered, this may be the first time the phrase 'delayed flight' might have ever been used in print. After an involuntary extended break from Podcasting due to technical circumstances beyond our control, Mister Ron's Basement is back with more great fun stories from the Public Domain!